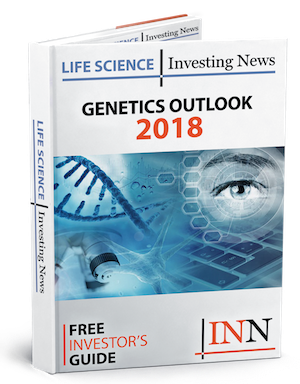 As Q4 and 2018 come to a close, the Investing News Network profiles the five top genetics stocks on the NASDAQ year-to-date. The genetics industry supports every other life science industry, with one contribution being the discovery of new genetic drivers of diseases. Earlier in 2018, investors and industry professionals alike shared excitement when AstraZeneca (NYSE:AZN) and Merck’s (NYSE:MRK) Lynparza received a breakthrough approval from the US Food and Drug Administration (FDA), becoming the first gene-specific therapy. Investors also showed interest when Myriad’s (NASDAQ:MYGN) supplementary premarket approval application for BRACAnalysis CDx was accepted by the FDA. Myriad’s drug will be used as a companion diagnostic with Pfizer’s (NYSE:PFE) poly ADP ribose polymerase inhibitor, talazoparib. Pharma and biotech companies often dabble in the genetics industry along with their core disciplines, showing there are opportunities for companies of every size in this space. However, the list below focuses on true genetics companies, primarily those working on genetic diagnostic tools. It shows the five top-gaining NASDAQ genetics stocks year-to-date. Data was collected using TradingView’s market filter, and all companies have market capitalizations between $50 and $500 million. All information was current as of December 4, 2018 at market close, and stats are quoted in US dollars. HTG Molecular Diagnostics lands first on our NASDAQ genetics stocks list. Known for its molecular profiling, this commercial-stage company has two platforms, the HTG Edge and HTG EdgeSeq. Aside from these, the company offers a full range of laboratory services, including VERI/O. In its latest financial report, the company announced year-on-year revenue increases of 26 percent and 101 percent for the three and nine months ended September 30. The figures came in at $4.7 million and $13.8 million, respectively. Also during the period, HTG launched the HTG EdgeSeq Precision Immuno-Oncology Panel and began delivering orders to translational and clinical researchers. Next on the list is Quotient, another diagnostic company. Its focus is on blood grouping and serological disease screening, and its MosaiQ technology platform offers tests for transfusion diagnostic instrument platforms. In addition to Quotient’s MosaiQ platforms, it also offers reagent and MosaiQ services. Quotient released initial data from its MosaiQ SDS verification and validation microarray in Q4. For 1,261 samples, the company achieved sensitivity and specificity of close to 100 percent for syphilis and CMV. Middle of our top NASDAQ genetics stocks list is Fluidigm, which focuses on life science tools to explore single-cell analyses. This pursuit is coupled with the industrial application of genomics. Ag-Bio is the main segment of Fluidigm’s business, and consists of preparatory instruments. In Q3, the company’s revenue increased 17 percent, rising from $24.7 million to $29 million during the same period a year ago. Its mass cytometry revenue grew 50 percent and its instrument revenue rose 32 percent. Next up is Celcuity, which focuses on cellular analysis by commercializing diagnostic tests and discovering new cancer subtypes. The company plans to develop the world’s first diagnostic test that uses a patient’s live tumor cell to identify its biological drivers. With its CELx Signaling Function technology, the company plans to shift away from the current mode of genomic- or proteomic-based analyses. As shown in its most recent financial results, Celcuity reported a higher net loss, higher research and development expenses and a lower cash position compared to the year-ago period. This is likely due to the company gearing up for clinical trials, one of which is with Puma Biotechnology (NASDAQ:PBYI). Landing last on our top NASDAQ genetics stocks list is GenMark Diagnostics. The company bases its work on multiplex molecular tests, which help to diagnose complex medical conditions. The tests are centered around its proprietary technology, called eSensor electrochemical detection. GenMark announced a position gain in its revenues in its most recent quarterly financial results. Recognized revenues increased 36 percent to $15.8 million from the same period the previous year. The company also submitted two panels to the FDA. I believe you have a few of the tickers confused on this report. ArQule Inc. ARQL. Adverum Bio, Inc. ADVM. ATHX = Athersys, Inc. XOMA = Xoma Corp. Thank you for pointing out the error, it has been corrected.